Editors: Gillespie, Rosemary G. and Clague, David A. Islands have captured the imagination of scientists and the public for centuries; unique and rare environments, their isolation makes them natural laboratories for ecology and evolution. This authoritative, alphabetically arranged reference, featuring succinct articles by leading scientists from around the world, provides broad coverage of all the island sciences. But what exactly is an island? The volume editors define it here as any discrete habitat isolated from other habitats by inhospitable surroundings. 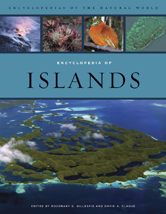 The Encyclopedia of Islands examines many such insular settings, oceanic and continental islands as well as places such as caves, mountaintops, and whale falls at the bottom of the ocean. This essential, one-stop resource, extensively illustrated with color photographs, clear maps, and graphics will introduce island science to a wide audience and spur further research on some of the planet's most fascinating habitats.